We’ve put together a range of rather tasty recipes, including some veggie options, to help you make the most of your garden grilling. In a bowl combine beef, garlic, hot sauce, salt and pepper, to taste, being careful not to over mix. Warm a skillet over medium heat and fry bacon until crispy. Remove to a paper towel-lined plate to drain. Keep heat on skillet and fry a pinch of the beef in the bacon fat to test seasoning. Adjust seasoning, if needed, then form 8 even thin burgers, about 1/2-inch thick and set aside. Saute onions in bacon fat in skillet until tender, 5 minutes. Place onions and bacon in a bowl with cheese. Form a spoonful of bacon-cheese mixture into a ball, then place in the centre of 4 burgers. Top each with another patty and seal the edges. 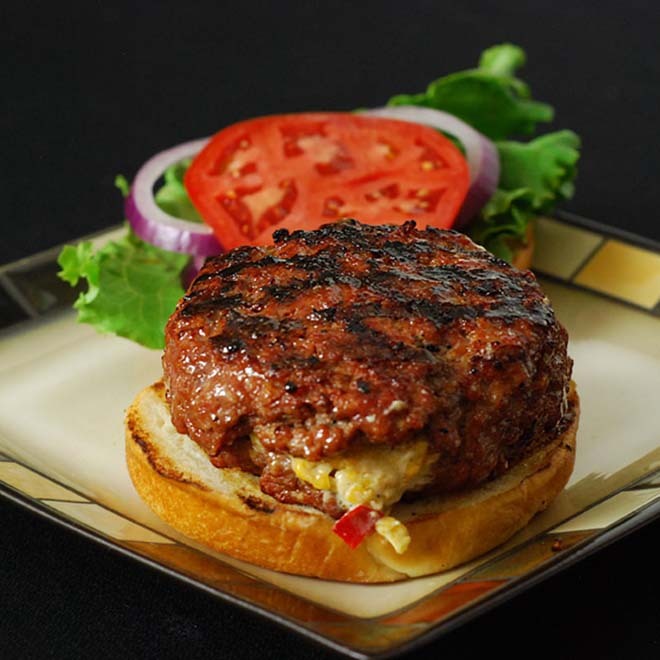 Grill burgers, flipping once until desired doneness is reached, approximately 4 minutes each side for medium. Serve in buns with garnishes. These sausages have the ultimate meat-like texture, which lots of new vegans miss. Perfect for cooking on the BBQ! Mix the hot vegetable stock with the porcini mushrooms and set aside for 5 minutes for the mushrooms to rehydrate. Sauté the onion & garlic until softened and lightly golden. Once you have sautéed the onion and garlic add it to a blender, with the remaining wet ingredients plus mushroom & stock mixture. Blitz until smooth. In a large mixing bowl add the wheat gluten & chickpea flour. Add the wet mixture to dry and quickly stir with a spatula until everything is well combined. You will then need to use your hands to knead the dough for around 10 minutes. Once kneaded, let the dough rest for around 10 minutes. Portion the dough into approximately 8 pieces (around 110g of mixture per ball). Pre-heat a large saucepan filled half way high with water. Bring to the boil then turn the heat down low, so that the water is at a rolling simmer. Prepare 8 pieces of foil (shiny side up and approximately 25cm long). Add a little bit of oil to the shiny side. Individually roll each piece of dough into a sausage shape with your hands then roll up in the foil. Twist each end and set aside. Do this for the rest of the dough pieces. Tightly wrap each sausage individually in cling film. Add the sausages to the saucepan water, pop the lid on and allow to cook for 50 mins. Don’t let them boil, just at constant slow simmer and give them a little stir every now and then. Meanwhile make the cider onions & prepare the rest of your hot dog garnishes. Finely slice the onions, and pre-heat a non-stick frying pan. Add a little oil, onions, salt & pepper and allow them to caramelise and go nicely golden. Then add a good glug of cider & the sugar. Turn heat low and allow to continue to melt & caramelise. Stir often for about 4-5 minutes. Then set aside ready to serve. After 50 minutes, check the sausages are firm. If they feel quite soft put them back in the water for an additional 5-10 minutes. If firm remove from the water. Allow to cool for about 10 minutes before carefully peeling off the wrapping. Pan fry in a non-stick frying pan for around 10 minutes until nice and golden. If you don’t want to cook them straight away you can freeze them & defrost later. Finally serve the sausages inside the hot dog buns with the onions and sauces. Enjoy! Peel back the husks of the sweetcorn, leaving them attached to the cobs. Remove the silky bits and wash the cobs well. Mix the chaat masala and chilli powder in a small bowl. Preheat the barbecue. 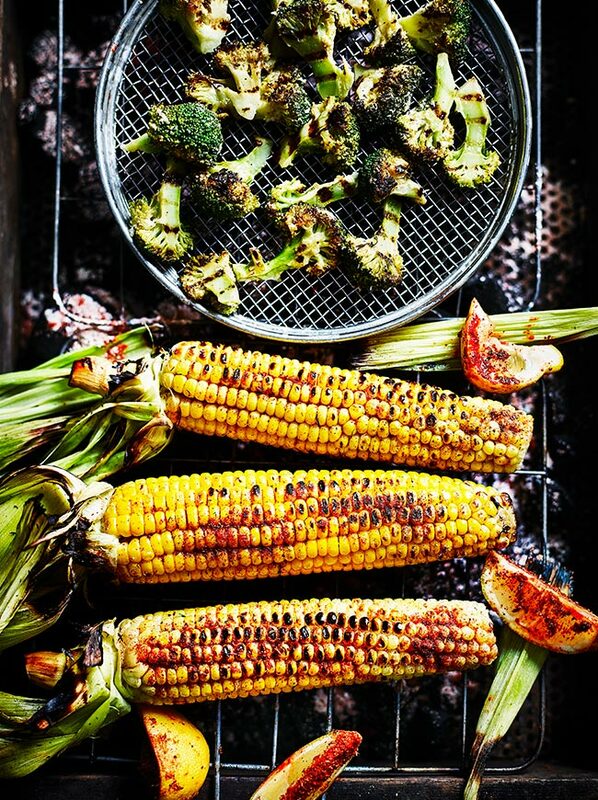 Grill the sweetcorn directly over a high heat, turning often with the leaves, until lightly charred all over (if it rains you can do this directly over a gas ame). When cooked, smear each cob with butter or crème fraîche, if you want. Serve the sweetcorn with the lemon wedges and a little mound of the spice blend on the side. Dip the wedge in the spices and rub them over the sweetcorn, squeezing a little lemon juice on as you do and serve. 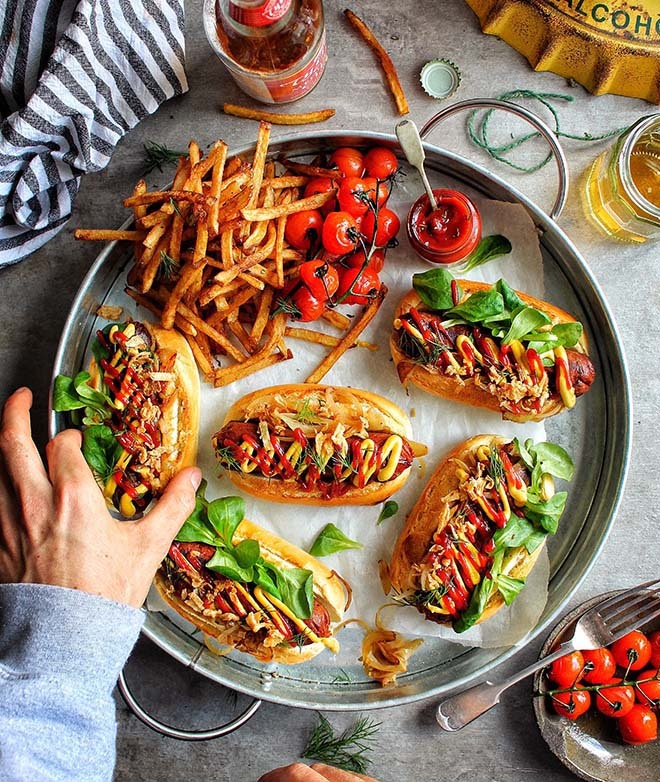 This barbeque season, put down the bottle of generic tomato ketchup and surprise your guests with something a little more original. 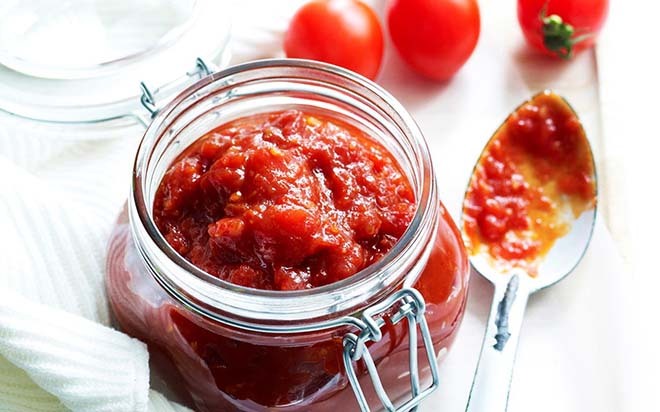 Island Grill’s (the sustainable restaurant in Lancaster London) Head Chef, Adam Woolven, shares his recipe for a tangy Tomato and Chilli Jam. Bring a large pot of water to the boil. Add the plum tomatoes to the water and boil for 10-15 seconds. Following this, run the tomatoes under cold water, then peel and quarter them. Peel the ginger (easiest done with a spoon), then finely chop it, along with the garlic cloves and chilli. In a large pan, cook the tomatoes, garlic, ginger and chillies on a low heat until the mixture becomes of pulp-like consistency. Pour the fish sauce, red wine vinegar and Demerara sugar into the mix. Stir well. Season with a little salt and pepper. Don’t wait for the jam to cool – store the jam in a sterilized jar whilst still hot. Scoop a generous spoonful of jam onto your freshly barbecued burger – and enjoy! Lamb is a classic kebab meat in the Middle East, but not something we Brits often think about BBQing. Perhaps this recipe will change your mind. Take a lean boned ½ lamb leg joint or use a boned and rolled shoulder joint, remove the string and lay flat. Place the flat joint into a dish and add garlic and rosemary. Rub into the lamb then pour over red wine, blueberry juice and honey. Cover and leave to marinate in the fridge for 1-2 hours. 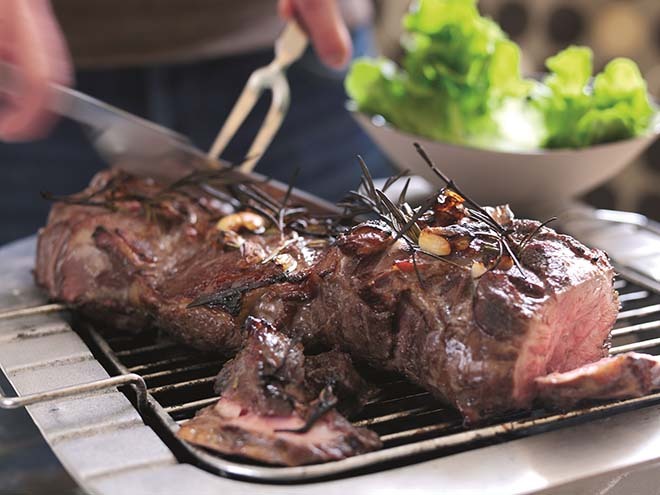 Remove from the marinade and thread metal skewers criss crossing through the meat to keep flat. 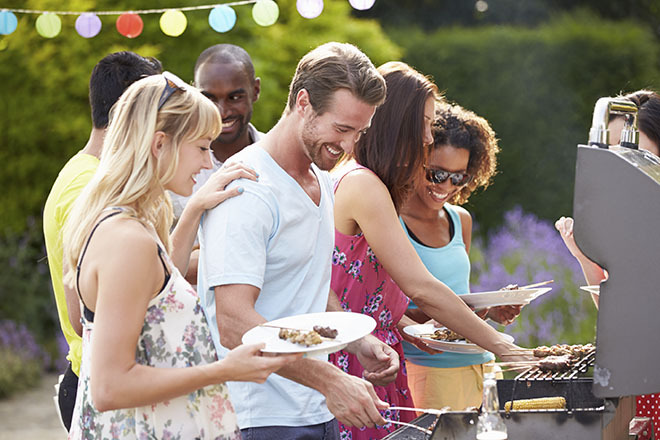 Cook on a lidded or covered BBQ – place flat onto the BBQ grid not too close to the coals, turning frequently for about 40-50 minutes. Alternatively place directly onto the shelf in a preheated oven (Gas mark 4-5, 180°C, 350°F) (place a tray underneath to catch the drips) for about 40-50 minutes until browned on the outside and still a little pink in the centre. Thoroughly boil for at least 5 minutes the remaining marinade and serve poured over the lamb joint, as a thin ‘gravy’. (If using the oven roast new potatoes, onion wedges and garlic bulb at the same time for approx 40 minutes until roasted and golden). Squeeze garlic purée from the skins and add with the onions to 60ml (4tbsp) mayonnaise. Serve the lamb carved into chunks with new potatoes, garlic and onion mayo, and heaps of seasonal green salad. Preheat barbecue for low heat. Halve each of the bananas lengthwise, then widthwise. Sprinkle bananas with lemon juice. In a small bowl, mix together the brown sugar and cinnamon. Roll banana pieces in sugar/cinnamon mixture until well coated. Lightly oil the barbecue’s cooking grate. Arrange bananas on grate, and cook for 3 minutes per side. Serve in a bowl with a scoop of vanilla ice cream topped with a sprinkling of remaining cinnamon/sugar mixture. Cut 6 ribbons along the length of the cucumber using a peeler. Place in a colander and sprinkle with the salt. Set aside in the sink to drain. Zest 2 of the limes and juice all 3. 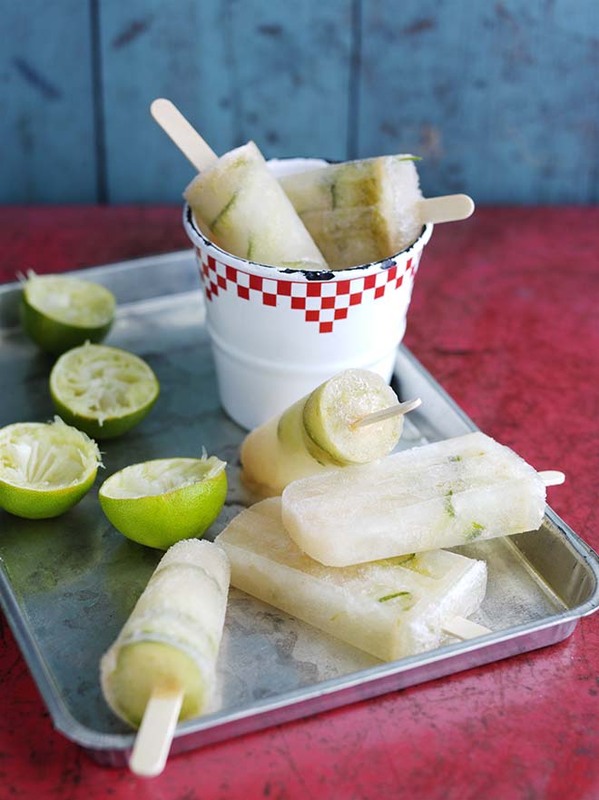 Combine all the remaining ingredients with the lime zest and juice. Rinse the cucumber ribbons and pat dry with kitchen paper. Loosely wind round a lolly stick and place up right in the mould. Pour over the margarita mixture and freeze for 4-5 hours until solid. For a virgin version, omit the tequila and orange flavoured liqueur adding in an extra 50ml lemonade.